My delectable dish might be your nightmare. Things I would walk a mile for are things you might like to dump in the garbage. What to me is ecstasy could be your ordeal. And that’s precisely what makes different foods so exciting– the discovery, the knowledge that you are about to push beyond your comfort zone and the anticipation of doing so. The French are known for their adventurous cuisine and for eating most anything that moves as well as every imaginable part of an animal. 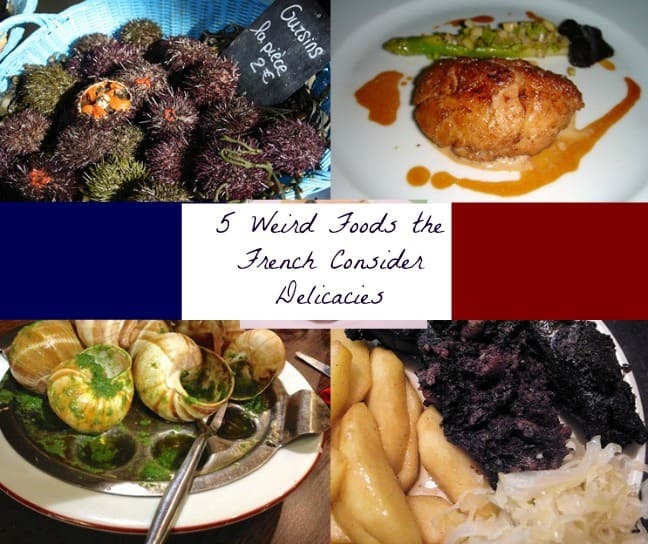 The following five weird foods are adored by the French, yet often detested by everyone else. When winter rolls around and the first chill wind blows across the mountains of France, it’s time for boudin noir, or black blood sausage. The closer one gets to the end of the year, the more ubiquitous it becomes. At first sight, there’s nothing to like: it’s congealed pork blood. As much as this might perturb the French, the original boudin noir reference came down to us not from France, but from Homer’s Odyssey, back in the days of Antiquity. Basically, when the pig is killed the blood is conserved, mixed (usually with vinegar) to keep it from setting, and then combined with various ingredients until it congeals. Depending on the region, these ingredients could range from onions to bread to rice. The mixture is then pressed into a length of gut through a funnel. Boudin noir comes in a variety of preparations. My favorite is boudin aux pommes, which is sautéed with sliced apples, slightly caramelized and dusted with a few spices. The sweetness of the apple tempers the boudin’s pungent taste. There’s a world of difference between industrial and artisanal boudin. Close your eyes and the industrial version will taste like slightly mildewed cardboard. Never buy it in a supermarket. It must always be bought in a charcuterie, a delicatessen, or at least from a butcher that specializes in cold cuts. Or, better yet, eaten out at a fine French restaurant. This isn’t such an unusual food, since it’s often found outside France. 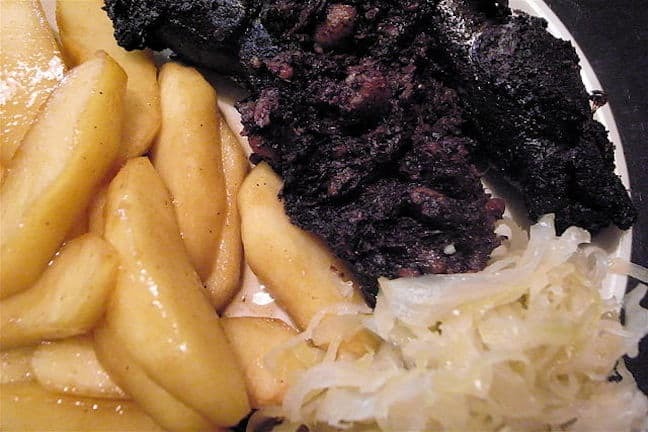 In the UK, black pudding tends to be eaten at breakfast; in Germany it’s known as Blutwurst; in Belgium it is bloedworst; and Spain has a variation called morcilla. It also comes in a tamer, more modern “white’ version,” made of white meats like chicken, veal or pork. What distinguishes the blood sausage from other sausages is… well, blood. Recipe for Boudin Noire via Chow.com. 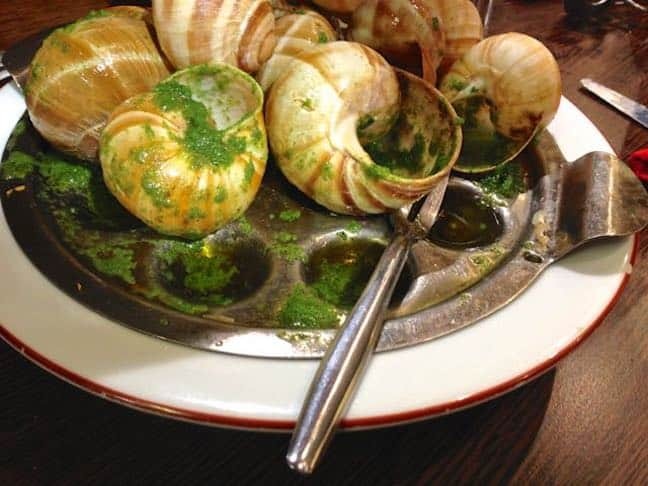 It’s almost a rite of passage when visiting France, the tasting of at least one escargot (or snail). Many foreigners pale at the thought of digging a rubbery creature out from a shell and feeling it slide down their throat. But I’m happy to take those little creatures off their hands. In France escargots tend to be eaten with healthy amounts of butter, garlic and parsley. The escargot often seems like an afterthought– a mere vessel used to carry the sauce while you mop up with a crunchy bit of baguette. Escargots have been eaten since Roman times, gaining in popularity over the centuries. They were even found in the ruins of Volubilis in Morocco (something I wish I’d known when I visited recently). There’s an anecdote that places Napoleon’s chief advisor, Talleyrand, in a Burgundy restaurant with Czar Alexander I in 1814. They arrived late, the food was gone, and the chef spotted some snails in his garden. In a panic he added garlic to mask the taste, parsley to pretty them up and butter to make them easier to swallow. Apparently the Czar liked the dish so much, he demanded the recipe. Whenever he saw snails after that, he referred to them as “snails from Burgundy,” or escargots de Bourgogne. Many people think snails are disgusting, and they can be if not handled properly. Before being cooked, they are purged by being fed special herbs. Then follows a complex dance of washing, boiling, cleaning and cooking– a 3-day procedure that explains why the best escargots are quite costly. Using the shells (which not everyone does) requires stringent washing and bleaching. In some countries the shells are replaced by a small puff pastry. It may be more hygienic, but the pastry absorbs all the butter, leaving nothing for the mopping up adventure that is at the heart of escargot nibbling. For the record, being part-French, I’m a shell person. Recipe for Escargots deBourgogne via Food.com. This dish’s name literally translates into “head of calf.” Despite my origins and the fact that I live in France, I’ve never been able to approach tête de veau with anything but disgust. Thousands of my compatriots, however, would chastise me for my prissiness. It is a kingly dish to prepare, as it takes hours in the kitchen. A good head requires at least three hours of boiling and simmering in spices, covered with a layer of fat. It is served with one of two sauces: gribiche, a mayonnaise-type sauce with added ingredients (often capers), or ravigote, which is thinner but similar, tending at times towards a vinaigrette. Neither is particularly appetizing to me. This is a dish that forgets its origins. No one can seem to agree where it came from, and many towns claim to be its home. Some even purport it to be English, and the dish is also popular in Italy. It would seem that at one time long ago a pig’s head was used rather than a calf. The improvement is minimal. This weird food is of such importance in France that the country is replete with confréries, or brotherhoods, dedicated to eating or promoting this dish. One such brotherhood serves this dish regularly in commemoration of the decapitation of Louis XVI. That said, it’s not an everyday dish and I, for one, don’t regret that one bit. Just FYI, tête de veau is also an insult hurled at Parisians by provincials who feel hard done by. Instead of a recipe, here’s a story about using Tête de Veau in an episode of Hannibal. The French enamoration with calves also extends to another body part, the thymus gland. 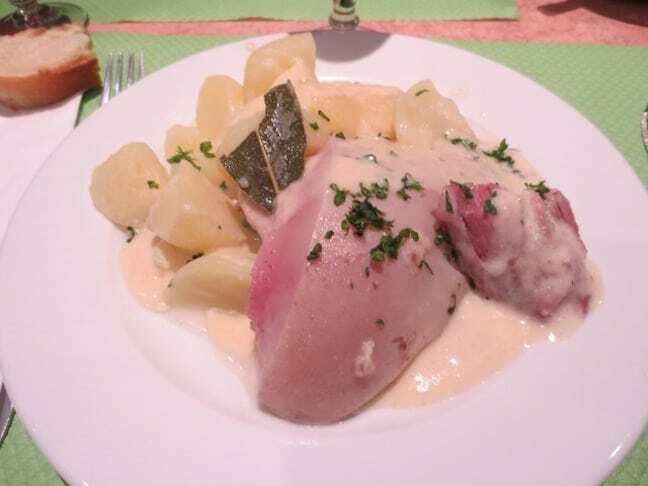 Again, this is an innard I have managed to avoid, although Ris de Veau is far more popular – and appetizing – than the brainy end of the animal. In English they’re known as sweetbreads, although there’s nothing sweet or bread-like about them. Here’s what my more daring friends have to say about this dish: “Like brains, only better. Creamy. A delicacy. Divine.” Escoffier, Bocuse and even Julia Child have positive things to say about the ris de beau. I, however, remain unswayed. Like the tête de veau, the origins of this particular dish lie hidden in time. Perhaps the ris harks back to an era of poverty, when every part of the animal had to be utilized– a custom still very much alive in France, where nothing (and I mean NOTHING) seems to go into the waste bin. Add to that a strong dairy tradition, and you have plenty of cows… and cows have calves. Since the offspring aren’t required for the production of dairy, they become available as food. Like escargots, the ris de veau is first purged, in this case by soaking it in clean, cold water several times to remove impurities. 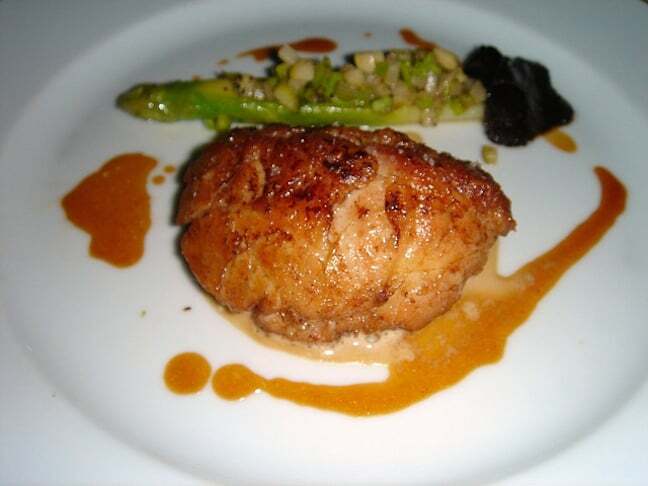 The sweetbreads are then poached, pressed, peeled and usually braised or fried. I keep trying to find someone who dislikes these, and keep failing. Perhaps I should give them a try? Ris de Veau recipe via the New York Times. Oursins, or sea urchins, bemuse me. How can anyone not like them? Given a choice of pleasurable eating I’ll run for the seafood. If there’s a sea urchin on that tray, it had better run! 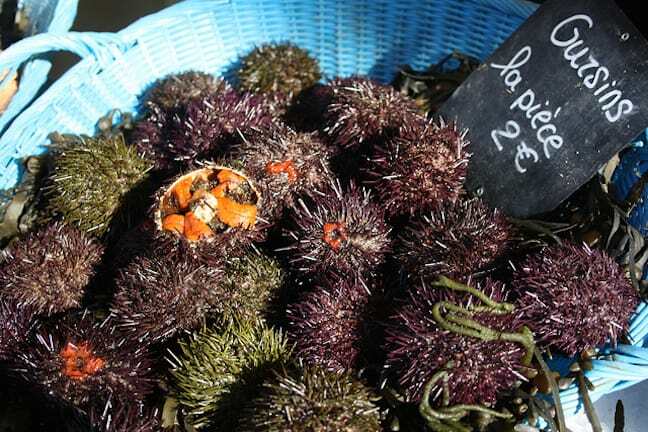 Like oysters, people are often put off by the sea urchin’s texture. The strong seaside smell, which is a bit like salt and rotten algae rolled into one, can be repulsive. Oursins are also difficult to eat. You can buy them by the unit or by weight, but it’s ruinous either way. First they have to be cut open with special shears, but you’ll need a tough glove, as they’re full of spikes that can rip your hands apart. If you have a choice, eat them at a restaurant and have an expert cut them open, especially since broken bits can find their way into the cavity if you’re not skilled. It’s not always easy (or even tempting) to eat such weird dishes as these. When faced with what I consider unpalatable food, I try to remember my first escargot. I was about six years old, and my mother offered me one from her plate. I had the expected reaction: Ugh! As she swooned over each morsel, my curiosity swelled until, finally, I couldn’t stand it anymore and broke down. Yes, I’ll have one! By then she was on her last escargot, and no amount of pressure would have parted her from it. The next time we went, I begged for my own plate. It was literally love at first bite. Lesson learned? Try it. Just once. You never know. Leyla Giray Alyanak is a journalist with years of experience in newspapers and broadcast news. She has been spokesperson for WWF International and a consultant for a number of environmental organizations, including the World Conservation Union, the EU’s Environment Directorate and the UN Environment Programme. 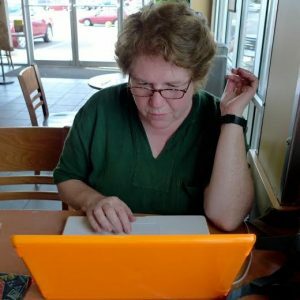 At 43 she backpacked solo across Africa as Chief Correspondent for The Earth Times, the premier environmental newspaper of the 1990s. Leyla now works for an international development agency and manages Women on the Road, a website that empowers women to travel solo. She recently wrote a book on solo travel for baby boomer women and is currently writing her second, a memoir on her time as a correspondent in pre-Internet Africa. 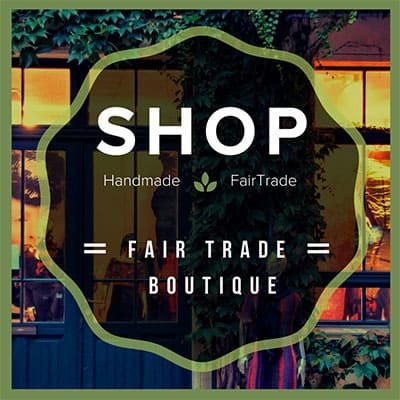 Follow her on Facebook, Twitter and Pinterest.